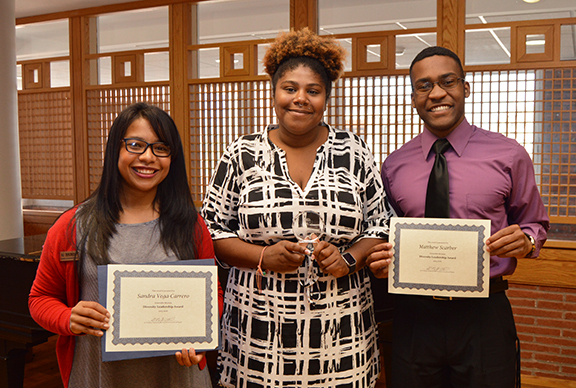 LAWRENCE — Two individuals and one group were honored with the first University of Kansas Diversity Leadership Awards from the Office of Diversity and Equity. The awards honor the contributions of people who have advanced dialogue and change related to diversity, equity and inclusion at KU. 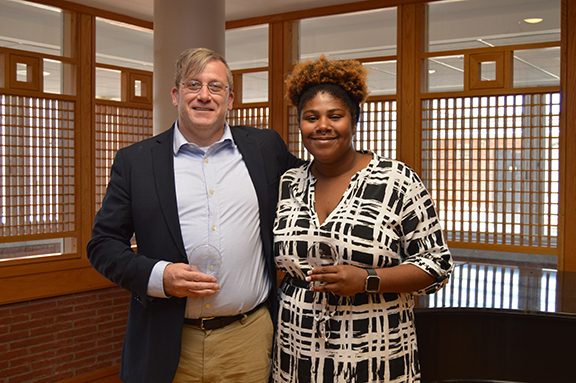 The Office of Diversity and Equity presented three awards — student, faculty/staff and group — and recognized several other nominees for their work at a ceremony Oct. 3. Graduate student Jyleesa Hampton, who also attended KU as an undergraduate, is a graduate teaching assistant and serves as an assistant coach for KU Debate. As an undergraduate debater, she was named the National Debater of the Year, and she and her partner became the first all African-American female team to represent KU at the National Debate Tournament. As a coach this past academic year she helped KU take second place at the National Debate Tournament with a team that included the first African-American woman to reach the final round of the tournament and the second non-male team to advance to the debate championship. During her time at KU, Hampton has worked to raise consciousness about issues of equity, diversity and inclusion in the campus community. She has actively promoted opportunities within the debate team for women, people of color and individuals with diverse gender identity. She also has identified and challenged ableism. Hampton has helped recruit and support diversity within the debate program and KU. Hampton has worked to expand opportunities for other students and has focused on ways the university can promote diversity within KU Debate, her own department, student government and the larger university community. She serves as a member of KU’s Diversity, Equity and Inclusion Advisory Group and has been actively involved in other ways that promote a climate that supports diversity at KU. Since 2008, African and African-American Studies Associate Professor Shawn Alexander has directed KU’s Langston Hughes Center, which serves as a hub of critical examination of black culture, history, literature, politics and social relations. Through the center he has led four major symposia and 80 talks and programs to raise awareness of issues of race, diversity, equity and inclusion. He co-founded with Provost and Executive Vice Chancellor Neeli Bendapudi, then dean of the School of Business, the annual Race and Sports in America Symposium, which has brought national attention to KU. The symposium and a related course have brought together Kansas Athletics, the business school, the College of Liberal Arts & Sciences, the William Allen White School of Journalism & Mass Communications, the Department of African and African-American Studies, acclaimed national sportswriters and past and current KU athletes to share narratives of discrimination and inclusion. In its first two years, the symposium has had a combined attendance of about 1,000 individuals. He also serves as co-chair of the Langston Hughes Visiting Professorship Committee. The LHVP program brings minority and diverse faculty to identified academic units at KU for a semester, with the prospect of hiring the visiting professor later if there is mutual interest. Alexander directs a Gilder-Lehrman Summer Institute that for the past five years has brought scholars and teachers from all over the United States to KU to explore civil rights and race matters and to visit historic places such as Topeka's Brown v. Board of Education National Historic Site and the Harry S. Truman Presidential Library and Museum. Over the past academic year, he has been involved in a number of projects on race and social justice issues for the KU and Lawrence communities. In addition to his regular teaching responsibilities, Alexander has actively worked as an adviser to students from diverse backgrounds — minorities, students with disabilities, international students, athletes and military veterans. Alexander also teaches an intensive summer course for Upward Bound and math and science students for the School of Education that prepares diverse students for academic success at KU. The KU Interactive Theatre Troupe is a group of student actors, writers and directors dedicated to using improvisational theater and performance to help campus groups and units deal civilly with challenging issues about difference. ITT performers, led by Chair and Associate Professor of Theatre Nicole Hodges Persley, create multimedia and interactive performances that can help the KU and Lawrence communities engage issues of diversity, equity and inclusion. Using Forum Theater, improvised performance, film, sketch comedy and hip-hop theater, undergraduate performer-researchers write, perform, produce and direct live and recorded performances using a wide range of improvisational tactics. Hodges Persley’s research addresses how race and ethnicity shape contemporary performance practices. She has conducted improvisational theatre workshops across the nation. Her research specialties in hip-hop theater, race and performance theory, and improvisational performance informs the ways that she teaches students how to integrate discourses of diversity, equity and inclusion into devised improvisational theater practices. All of ITT’s undergraduate and graduate students conduct research, write, direct and produce all aspects using improvisational techniques. Since 2009, ITT has created programming efforts that have reached KU student-athletes, the KU Public Safety Office, the Center for Teaching Excellence, the School of the Arts, Haskell Indian Nations University’s theater program and several departments within the College of Liberal Arts & Sciences. Campus protests led by the student group Rock Chalk Invisible Hawk in 2015 raised awareness of issues of invisibility, inequity and systemic inequality experienced by many students of color on the KU campus. ITT was called by several units to create productive, interactive theater programming that helped individuals and groups engage in constructive dialogues and strategy building about this work. The troupe’s performance topics included gender fluidity and pronoun usage, Black Lives Matter, religious diversity and equity, concealed carry on university campuses, sexual harassment and discrimination, and transgender literacy. During the past academic year nearly 1,500 KU students, faculty, staff and administrators took part in an ITT performance training. ITT currently has 12 students from a variety of academic majors and one graduate teaching assistant who facilitates training. The students and faculty affiliated with the troupe attend or work at KU full-time and receive no special accommodation or service differential for their ITT work. 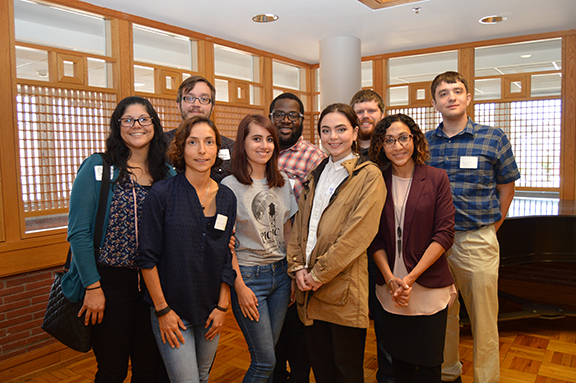 University Honors Program Think Tank for Equity and Inclusion, recognizing students Theresa Amante, Anna Balmilero, Constanza Castro, Jeffrey Durbin, Jade Hall, David Menager, Hannah Morrow and Sandra Sanchez.